“They provide additional voltage headroom for industrial, telecom, and renewable energy applications when desired,” said the firm. 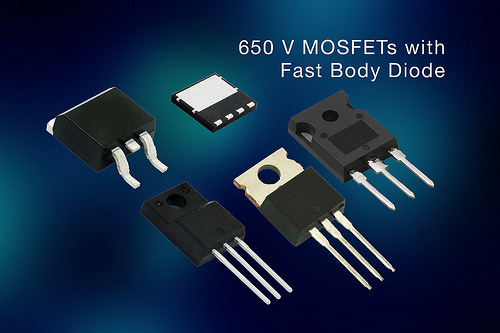 Built on E Series super-junction technology, they feature 10x lower reverse recovery charge (Qrr) than standard mosfets, which allows the devices to block the full breakdown voltage more quickly, helping to avoid failure from shoot-through and thermal overstress. Also, reliability is increased in zero voltage switching (ZVS) or soft switching topologies, such as phase-shifted bridges, LLC converters, and three-level inverters. 21A SiHx21N65EF is offered in five packages, while the 28A SiHx28N65EF and 33A SiHG33N65EF are each available in two. On-resistance is down to 157, 102, and 95mΩ, respectively – see table below for capacitance. The devices are designed to withstand high energy pulses in the avalanche and commutation mode with guaranteed limits through 100 % UIS testing.